Who said self publishing was hard? The Novum: Rubicon (Novum #3) manuscript came back from my editors last night with only minor fixes (not enough commas, apparently), so I spent the morning putting everything into paperback and ebook formats. In the past, those "publishing" steps used to take me weeks of trial and error - not any more. Two hours and I was done. Everything is now uploaded for the October 1st release date, and next Monday I should be able to post the Pre-Order links for all formats. This will be a very relaxing weekend for me. NOVUM: RUBICON will be available worldwide in paperback and all ebook formats on October 1st. Expect a pre-order link from Amazon soon. You heard it here first. 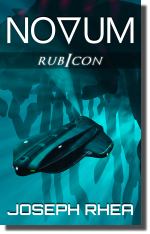 Novum: Rubicon has gone through 4 edits, and has been shined and polished as much as I can do on my own. Next week it goes to a professional editing service for a final proof read. I am excited to get this story out to the world. 2) Several long walks listening to a British woman's voice read my story back to me (Ivona text-to-speech program is best for this.) This completes my final polish. 4) The I send copies to a few select beta readers for overall impression. 5) Finally, the manuscript is emailed to the well-paid-but-worth-it editors for final proof reading. Following this, I start the publishing process. I format two editions, one for paperback and one for the various eBook formats, and then upload it all to the various distributors, along with my brother Dave's final version of the book jacket and cover. This part used to be very difficult to get right, but I have a lot of experience now so this doesn't take me long. After the final proofs of all versions are checked out, I give them the "okay" to publish, then I let all of you know it's available. Check back soon for that! After several months of trying different prices for the eBook version of the first two books in my Novum series, ranging from 99 cents to $2.99, I have finally made a decision to go with a fixed prices of $1.99 for each of the five books (two available now and three more coming up). Why $1.99 per book? Several reasons actually. At the lowest price Amazon allows, which is 99 cents, I only make 35 cents per book, and considering what I pay for a professional editor to proof each volume, that's just too little. Conversely, the upper end of 2.99 per book I feel is too much to charge for a 25-30 thousand word story, especially one that is part of a series. At this price, I would be asking a reader to shell out nearly $15 to complete the series, and I just can't do that. That leaves the middle price of $1.99, which boosts my royalties a bit, but more importantly, my readers will end up spending just $9.95 for the complete set, which is the price of many single novels on Amazon. When all five books are released, I will also release a single "combined" book, which will sell for a bit less, maybe $7.99, since additional editing will not be required.